The Garvey price gun makes your labeling tasks easier. Keeping in line with the latest industry trends, the design of the Garvey gun has recently been improved making it more user-friendly than ever. It's comfortable handling, reliability, and simple drop-in loading features are some of the most impressive on the market. Experience a tool that is as close to jam-free and stress-free as they come. Customers love how well-built, fast, and easy the G-Series Garvey price guns are to use. All the various models are available with different band options. The options include: date, price, time, was-now prices, unit/package pricing, lot and batch numbers in alpha and numeric characters. A date band for instance, is popular with bakeries, restaurants, supermarkets, delicatessens, convenience stores or anywhere that merchandise not only needs a price but also the date printed on its label. Garvey is one of the leaders in the industry regarding the alpha/numeric print functionality. Garvey no longer distributes the Contact price gun because they engineered their own line; the G-Series. The tools share a lot of the same qualities such as the loading process and model names. The G-Series run the exact same labels that the ran through the Garvey Contact pricing guns. The first number (18, 22, 25, or 29) refers to the label width in mm. The second number (6, 7, 8 or 9) refers to the maximum number of characters the price gun prints. Do you have a labeler and are not sure of the model number? There is a vertical sticker on the side plate of a Contact gun with the model number; 6.18. The G-Series Garvey gun has the model number stamped on top of the print head. The labelers are black and the model and exact band layout are stamped in white. Hold the tool normally, and look straight down and you'll see the numbers. It could be something like Garvey 18-6 #1601, or 22-88 #2802. There are two possible adjustments that can be made with the labelers. The print head, which is the part that stamps the print characters on the label, can be moved to print higher or lower on the label. Two screws, one on each side of the unit, hold it in place. Loosen each, slide up or down, and re-tighten. The second adjustment option (if ever necessary) is changing how far the label is dispensed from the unit. A screw on the base plate can be twisted right or left. Small turns are all that is necessary for this adjustment. When building their price guns Garvey strives for excellence. The tools should be delivered to you in 100% correct working order. It is just nice to know that throughout the life cycle of the unit slight tweaks can be made if necessary. Arthur Schmit created a company that produced a variety of stamps called Cosco Industries in the late 1940's or early 1950's. Cosco mainly produced a rubber stamp which was circular in design. They had a wooden handle stick and could stamp from 1 to 99 cents. The stamp pad was attached to a cart so the user could move about a store to mark prices. Arthur joined with Ed Garvey to make a band stamper. This item became very popular. In the 1960's, Garvey (which is now part of Cosco) landed the rights to sell the first hand held labeler which was made of metal. The first Garvey price gun was born. With the popularity of the hand held pricing unit, General Mills acquired the company for a nice sum. However, the business was not properly managed which decreased the value of the company. Arthur Schmit purchased the company back for much less than what he sold it for, and began re-building. Within a short time, Costco is again seeing healthy profits from Garvey Products; on the wings of the Garvey label gun. Next, Rick Gmoch brings in the Contact line of label guns to improve upon the quality and reliability. Garvey becomes the top bread winner brand for Costco. Art unfortunately passes and his three sons eventually decide to sell the company. Taylor Corporation acquires the brand and appoints Jeff Griffin to President. Jeff quickly gets to work making changes with one of the first orders of business to change the design of the tool. The Garvey G-Series is created around 2005 and produced in Italy. 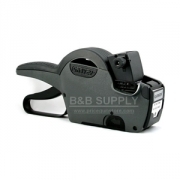 The Garvey price gun continues to be a very popular choice for hand held labeling today.